The Crosley Bluetooth iJuke Jukebox opens the door to connections with virtually any Bluetooth compatible device, rendering the need for an iPod dock or USB connection unnecessary. 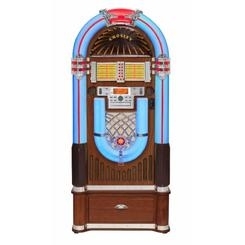 Sweet memories of malt shops and sock hops are back, courtesy of the Crosley Full Size Bluetooth Jukebox. Based on a classic jukebox design, this ultimate entertainment companion is a treat for the eyes and ears. Complete with color shifting LED lighting, this jukebox is sure to put the cherry on top of anyone’s sundae. While providing a good dose of nostalgia on the exterior, the interior is full of all the modern technologies we’ve come to love. This rockin’ good time comes complete with an AM/FM radio, CD player that reads MP3 and WAV files, and full Bluetooth support for both mobile and stand-alone devices.Features:Bluetooth ReadyAM/FM RadioFront-Loading CD PlayerColor Shifting LED LightingDecorative Musical PlaylistWood Style CabinetHand Rubbed Walnut FinishWoven Grill ClothProgrammable 20-Track MemoryOptional Compact Disc Storage BaseUltra-Compact Remote ControlSpeakers:Speaker Size: 6.5" Dynamic type x 2Speaker Ohm: 4 OhmSpeaker Watt: 40WSpeaker Size: 2.5" Tweeter type x 2Speaker Ohm: 8 OhmSpeaker Watt: 10WPower Output: 12W x 2*Stand ships separately.